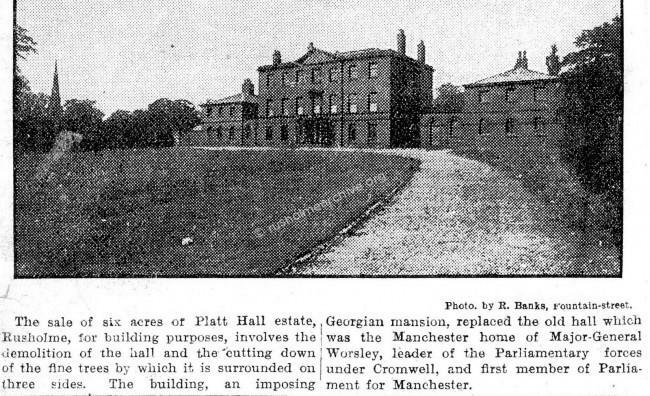 Platt Hall came into the ownership of the Worsley family in the early 17th century. They Worsley family were prosperous textile merchants whose descendants eventually replaced the old black & white timbered building with the present Platt Hall in the mid 1760s. 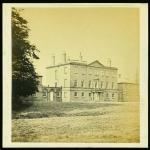 Platt Hall was built in the mid 1760s at a cost of £10,000.00. The architect was principally John Carr of York, a notable architect, but much of the building was supervised by Timothy Lightoler, who made various changes from the Carr design. In this photograph, (top left above), taken by Helmut Petschler in the mid 1860s you see the house as designed by Lightoler. Later in the Victorian period the small ground floor windows were replaced with large sash windows. These in turn appear to have been replaced by ' Georgian style' windows after Manchester City Council purchased the property. 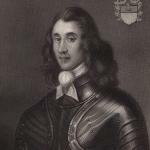 General Worsley of Platt Hall was a great favourite with Cromwell, who gave him command of his own regiment of foot. It was in this capacity that he accompanied Cromwell when, on April 20th, 1653, he dissolved the famous Long Parliament. We are told that commanded by Cromwell to meet him, Worsley " with his wife did set off to ride from Platt to London." On the day when Cromwell dissolved the Long Parliament, Worsley was desired to wait outside the house with a band of 300 soldiers until he should be ordered to enter the house. Presently Cromwell stamped his foot, which was the appointed sign, and Worsley and his 300 men went in. They first displaced the speaker, next struggled with other members, then Cromwell went to the table where the mace lay, and pointing to it, he cried in the now historic phrase " Take away that bauble." From the fact that Worsley was the captain of the force, and that the bauble was kept in Worsley's custody and brought from his house when wanted in the next Parliament, it is fair to conclude that he himself carried it away. Therefore, says the historian of this period, " the immediate instrument of Oliver Cromwell's famous deed turns out to have been a Manchester man "—pardon me, a Rusholme man. Later he was appointed by Cromwell as the first MP for Manchester. Cromwell had divided the country into ten regions and Worsley was in charge of one region, the combined counties of Staffordshire, Cheshire & Lancashire. Perhaps the strain of this office was too great because he died at the age of 35. He was buried in Westminster Abbey. Cromwell granted his widow and children a pension of £300.00 a year for life. 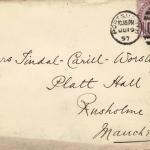 An envelope addressed to Mrs Tindal-Carrill-Worsley, (the last of the Worsley family to live at Platt Hall), sent from the naval warship HMS Alexandria at Portsmouth in 1897. 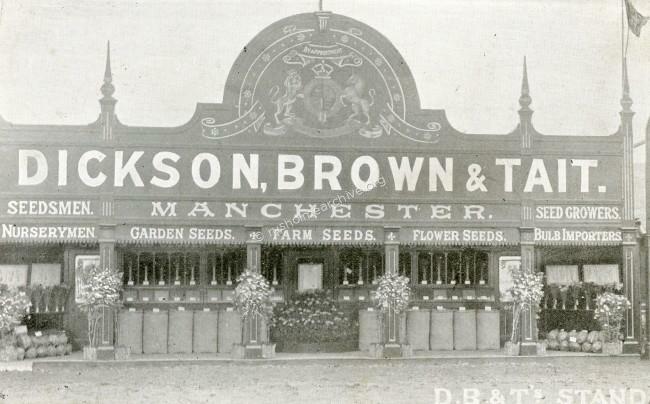 Photograph below appeared in the Manchester Evening News in June 1907: I wish to thank the Manchester Library Archive for permission to reproduce this image. Particularly interesting is the specific mention that the Hall would be demolished together with the trees on three sides of the Hall, in all 6 acres, so that new properties could be built. 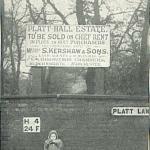 There had been two attempts to sell the estate but in1907 it became very clear to William Royle, a prominent Rusholme citizen, that the Platt estate would be sold for housing development. He wrote a letter to the local press which was headed, 'A Pathetic Appeal'. In the letter he argued that at the very least the ancient trees and the rookery should be saved, adding that if it were sold one of the best 'lungs' in the city would have gone and with it an incomparable connection with past history. 'That this meeting of citizens respectfully request the Manchester City Council to enter into negotiations for the purpose of purchasing the Platt Fields Estate for the use of the public.' Carried unanimously! On Monday 29th July a deputation from the Rusholme meeting met the Lord Mayor, (Councillor Harrop), and pressed their case. They were in turn supported by the Manchester Sanitary Association, Manchester Ratepayers Association, Manchester Property Owners Association, Retail Traders Association, Manchester and Salford Playing Fields Association together with a number of the most prominent citizens. They all argued that securing the Platt Estate would make an important contribution to the beauty and health of the City. A Town's Meeting was held on July 31st and again another large and enthusiastic gathering overwhelmingly voted for the cause. Finally on 7th August the Town Council resolved to buy the estate and commenced negotiations with the Carrill-Worsley solicitors. Quite remarkably within only a few days William Royles 'Pathetic Appeal' had realised his dream. 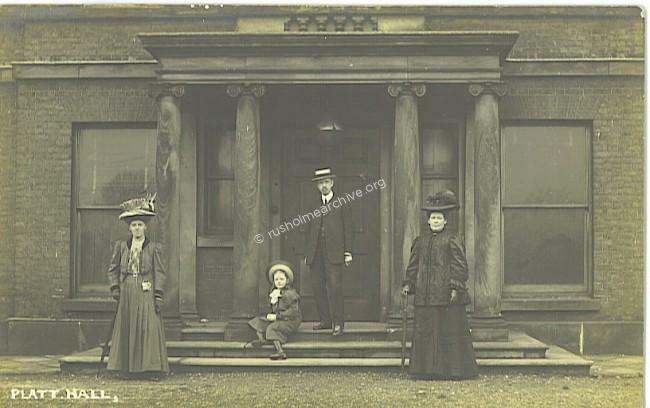 William Royle below on the steps of Platt Hall with some of his family. After negotiations with the Platt Estate the grounds and Platt Hall were purchased on 7th January1908 for a total of £59,875.00. 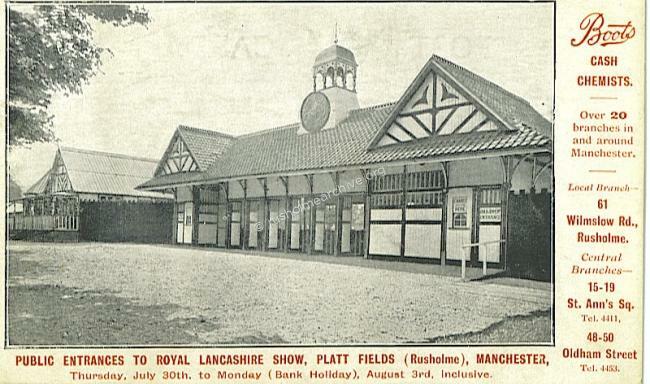 Within months of the City Council acquiring Platt Fields it agreed to two large exhibitions being held in the grounds of Platt Fields. 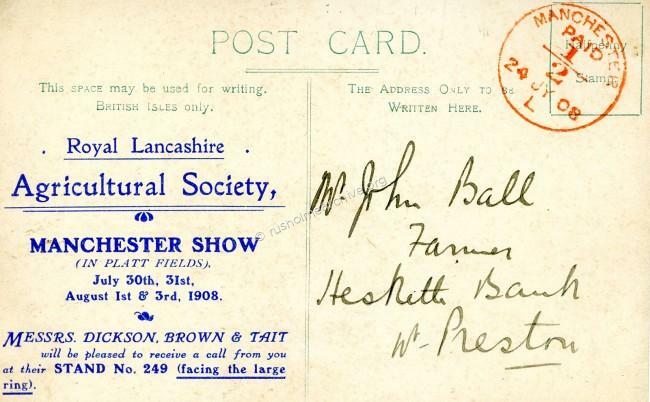 The Royal Lancashire Agricultural Society held its Show between July 30th & August 3rd. 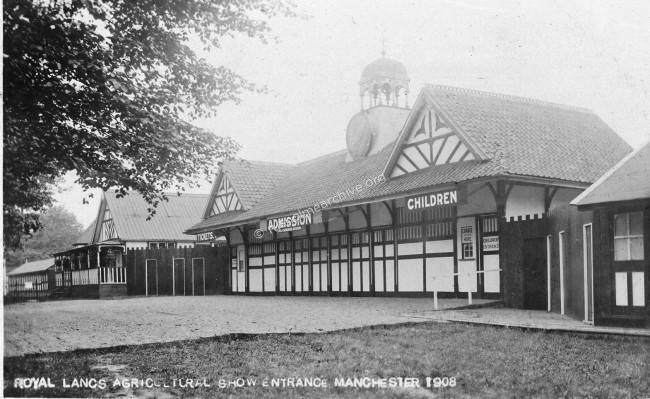 It was apparently considered very popular with many thousands of visitors coming to see the many exhibits, ranging from cheesemaking, horticultural displays, livestock and horsemanship. This exhibition is the subject of a separate page further down the menu. Next page; Creating the Park & Boating Lake.